I’m a 43-year-old woman, married and the mother of two daughters, Heather and Shawnee. I’m also a proud grandmother to Damian, who is one year old and I’m so happy I’m healthy and able to chase him around! San Bernardino County has been my home and I’ve spent the past 22 years living in the desert near Victorville. I drive a school bus and my life has changed completely in the past two years. I want to tell you my story, which starts with my lifelong problem of being overweight and ends with the happy fact that I no longer have that burden in my life. After decades of carrying excess weight around, I am so grateful to be able to tell you that I’m only 3 pounds from my goal weight – for the first time in my life! It’s not that I was a sedentary kid; growing up in Mira Loma, I played softball, rode horses and was active and healthy. Until I was 13, I didn’t realize I was overweight. Then a time came when I became aware that everyone else seemed to be skinnier than I was. Still, I have to admit I didn’t care all that much. I wasn’t a follower, my life was busy and I was pretty contented, even though kids called me fat and it did hurt my feelings. I know that my parents worried about my weight, and I remember hearing, “Do you think you really need another taco?” when they saw I was reaching for more food than I needed. But they didn’t browbeat me about it and I knew they loved me as I was. After high school, I got a job working on a road crew with all-male coworkers, laying asphalt and concrete. I was a strong girl and got a lot of exercise, but I also ate a lot. Still, I kept pretty fit during that time, handling jackhammers and shovels and being on my feet continuously. Throughout my 20s, I wasn’t all that overweight and my size didn’t stop me from finding a partner, getting married and having my children. My first daughter was born in 1988 when I was 22, so I was a homemaker for a couple of years. 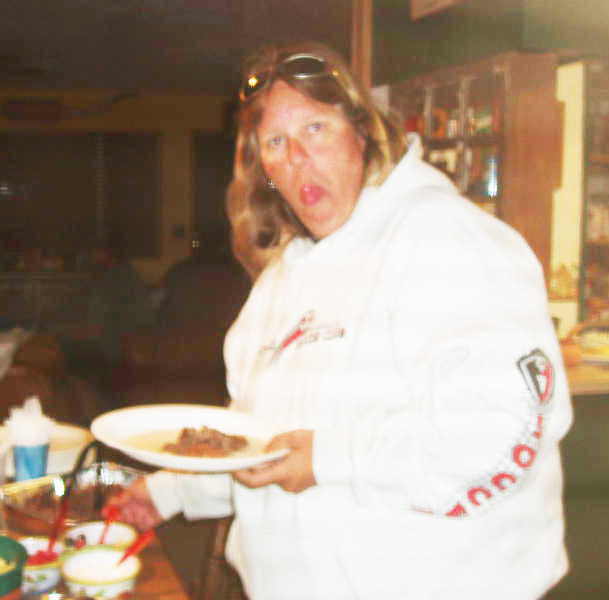 I gained about 70 pounds with that first pregnancy, and I knew it was too much, but food just tasted too darn good! When my daughter was two, I got a part-time job driving a school bus and a couple of years later my second daughter was born. I didn’t gain much weight during that pregnancy; in fact, I was back into my normal clothing a month after her birth. My health was good but my marriage ended in divorce. As a result, I lost some of my excess weight during that time. I was a busy single mom. I met my current husband in 1995, and we were married in 2001. During those years, I settled into my comfort zone and over time I gained back all the weight I’d lost. Still, life was good and my weight wasn’t that big of an issue for me. I had two beautiful girls, a great husband, and an active, satisfying life. I guess I was in denial. Then in 2007, I was sitting out on my back porch and I looked down and noticed the rolls on my arms. That was when it hit me: this is not ok! I was up to 240 pounds at that time, and I realized that I had to do something. It’s not that I didn’t try: I tried diets and drinking more water and did different kinds of exercise. But nothing seemed to work. I asked my family doctor to keep track of my efforts, in the hope that I could be referred for weight loss surgery. My doctor put me on a 6-month regimen that he created. It was hell. I fell off the chart with weight gain, no matter how hard I tried. Finally, I said, “Forget it! I’m not doing this anymore.” The ups and downs, the “this and that”…and the turmoil…it was overwhelming. I first heard about lap band surgery in 2007 and finally attended a seminar on it in January of 2008. Then I went for a consultation at Inland Cosmetic, which went well. They answered all my questions and I was excited, but then I found out my insurance company wouldn’t cover the surgery. So I spent months trying to work it out before going back for a second consultation at Inland. I told them I couldn’t afford it, but they helped me realize that it was do-able and assisted me in getting financing. Finally! I booked my surgery date and I have to admit I had second thoughts at first. The idea of surgery was scary and I hadn’t told anyone except my husband, my kids, and my mom. I eventually realized that I had undergone prior surgeries in the past that had gone well and that this surgery could save my health and give me a better life. Once I thought about all of my choices and all of the ways my life could be better, I was able to be clear about my choice. My surgery was done in June of 2009 and it went well. I was taken to the recovery room afterwards and was able to go home later that same day. I was sore for the first 4 days and took the pain medication I was given for two of those days, but the surgery wasn’t bad at all and I was able to rest well at home where I’m comfortable. My family took care of me, and I had a lot of time to reflect on what the coming year would bring. Deciding to have the surgery was the first hurdle. Learning to live and eat in a healthy way would be the second. I knew I would have to work hard to pay attention to what I would be able to eat and which foods would give me enough nutrition. I had to learn how much protein I needed to keep me mentally alert and healthy, how many grams were in certain foods, which foods were best for me, and how to eat after lap band surgery so that I felt well. It was a lot of change for me at first and I had never even read a food label before! After lap band surgery, you can only eat a tiny amount of food. The first month, I mostly had liquids – protein shakes, broth, that kind of thing. All of the knowledge I had gained from the staff at Inland and from the materials they gave me started to set in and this information teaches you to do what you have to do to get the best possible outcome. I made my share of mistakes, like overeating at times, but you definitely learn what works and what doesn’t. I learned to eat the small amounts that my body can handle. I learned to chew my food really well, and to take my vitamins (kids gummy chewable vitamins!) and get enough olive oil in my diet for overall moisture and hydration of my skin. I admit that I miss being able to just eat whatever I want, but this is the best decision I could have made for myself. I eat whatever I feed my family – I just have to eat less. And I’m cooking better for my family, in the process, so I feel good about that. It’s a life choice for the better for me. I weighed 247 pounds after my surgery and now I weigh 167 pounds. 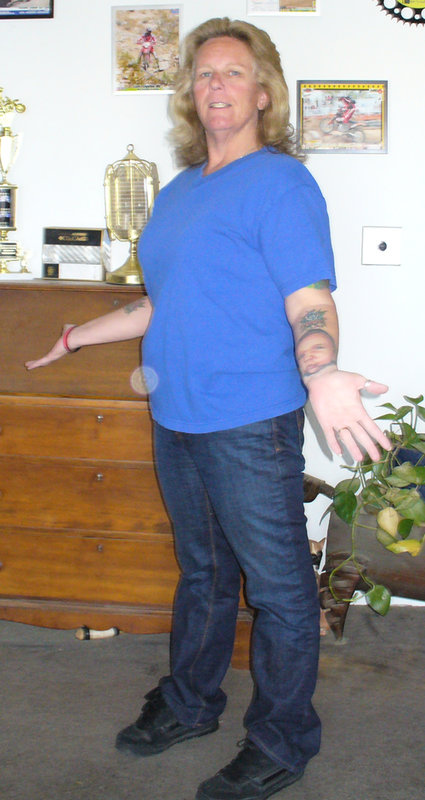 The weight loss was rapid at first – and I went from a size 20 to size 10. I also went from XXL t-shirts to a woman’s large t-shirt. And I do what I need to do. Once I lost some weight, I became motivated to get exercise and I have kept it up. I go to the gym 2-4 times a week, doing Yogilates and Step & Sculpt classes, lifting weights, and toning my body on the Stairmaster for 20 minutes at a time. How am I doing th ese days? I’m doing awesome! I’m extremely happy. I feel good and I look better. I can run around when I’m playing with my grandson and keep up with him. I can move around doing my regular activities without getting winded like I used to. Now I can wear nice clothing, too – and it’s been many years since I could think about clothing without feeling bad about myself. 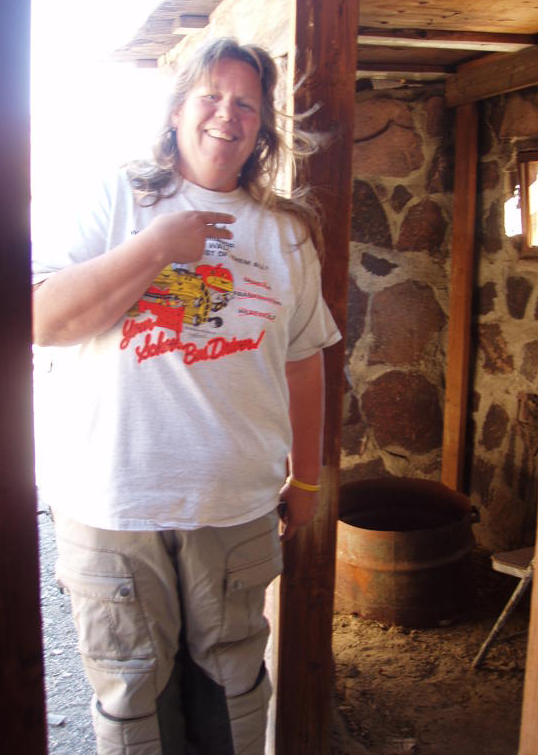 Before losing the weight, I just wore baggy Levis and baggy t-shirts. I had worn form-fitting pants in my younger years, but now I can wear them and they look great on me. It’s just amazing. There’s no easy way to bring your body back to health and fitness. I talk to a lot of people who are interested to know what I did to lose so much weight and what my experience has been like. I really want to talk to others, too…to tell them it’s not easy. You have to pay attention. You have to be committed. And you have to do the work. It’s not the surgery that’s the hardest part; it’s changing your habits to do what’s good for you, so you can maintain the gains you achieve after the surgery. It takes patience. You have to learn what you can and cannot eat and you have to make the necessary sacrifices if you want to look and feel great. But it worked great for me. It’s changed my life for the better in so many ways. If you’re out there and you’re thinking about doing this, I hope you do. It’s a gift to yourself and a gift to those around you. My husband is happy, my dad is proud of me, and my kids are happier, too. When you take care of yourself, you’re taking care of those you love. I’ve never been happier!